The Thistle Bindery trained with a master bookbinder in Edinburgh and follows the traditional techniques of bookbinding. This means that the bindery uses an assortment of bookbinding tools that is specific to the trade. 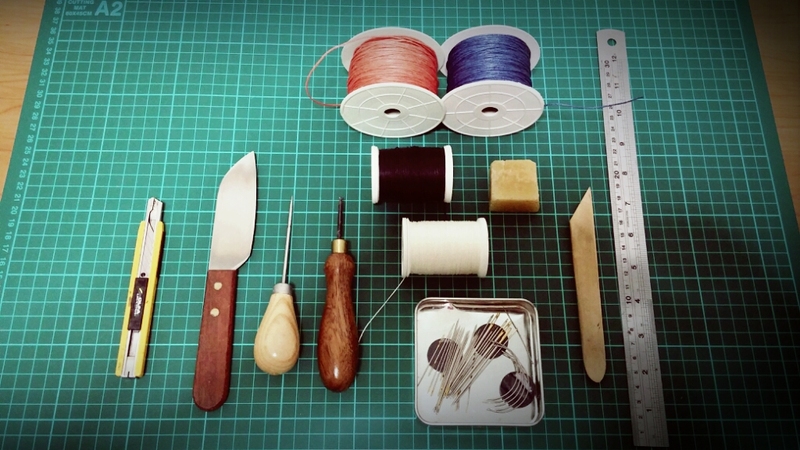 Basic tools include (from left) Penknife, Cutting Knife, Bookbinding Awl, Bodkin, Waxed Cotton Cords, Waxed Linen Thread, Beeswax, Assorted Needles, Bonefolder and Ruler. 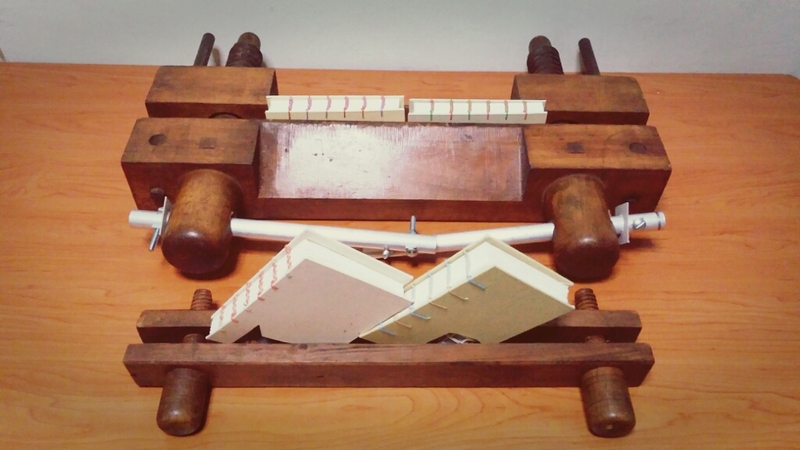 A laying press is used to hold signatures or a book block together in order to saw holes on the spine, sew headbands and hold adhered elements together during the drying process. The Thistle Bindery has two laying presses in its collection. The bigger one is a combination press, which has both the finishing press (with the sloped edges) and the laying press (with a flat surface area with a groove rail for the paper plough to sit). The smaller one is a fairly portable press that can be disassembled fully into 4 seperate elements — 2 turning screws and 2 platens. Once the sewing of a book is completed, the book is put under pressure for an extended period of time. This allows sufficient time for the drying of adhesives and help to give shape to the book. 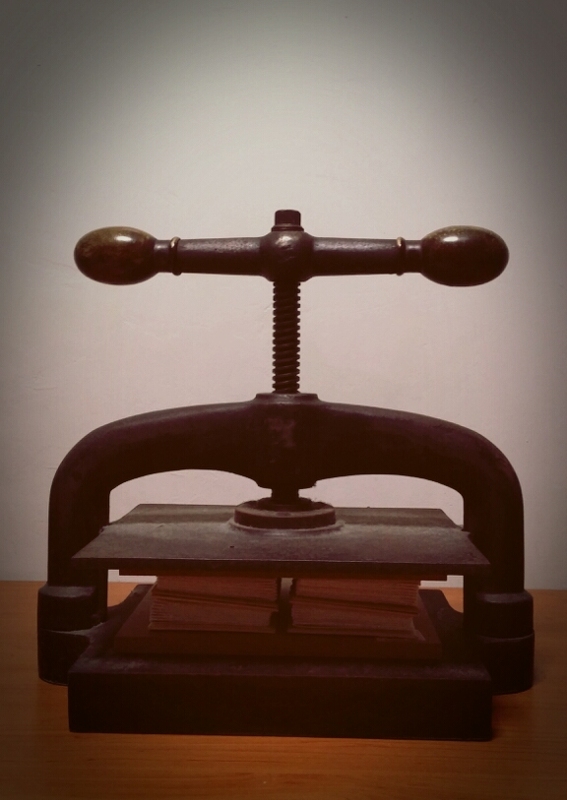 The cast iron Nipping Press used by the Thistle Bindery was scoured from Melaka, Malaysia. There are no discernible manufacturer’s mark or trademark but there is a 1818 marking found on the bottom of the press. Do you have any suggestions for where to purchase supplies in Singapore? In particular I’d like to find an awl, waxed linen thread, bookbinding needles and binders board (for covers). Hi Katie, for awl, you can get it at most sewing stores like Golden Dragon and Koi Ming. For bookbinding needles, you can replace with cross-stitch needles. Binders boards such as greyboard can be bought at Art Friend. Waxed Linen thread, unfortunately had to be bought online.